'This slender yet joyous film introduces so many fresh insanities and has such an endless stream of wisecracking that it takes on shades of a running ballad,' notes Sreehari Nair. Watching Ashwiny Iyer Tiwari's Bareilly Ki Barfi is like watching an Irish Drinking Song being performed for two plus hours. This slender yet joyous film introduces so many fresh insanities and has such an endless stream of wisecracking -- full of rhymes, segues, and twisted phrases (stuff like Zor Ki Yaad) -- that it takes on shades of a running ballad. At one point, Kriti Sanon's Bitti Mishra expresses confidence that her fan letter would receive a reply, and as she says Aayega, you can see her doing a little puppet dance. That shot is so inspired and yet it rushes past you at such a precise clip that it becomes giddily beautiful. The script has an energy that seems to have sent all the actors over the rainbow and out they slide from the other end, with their characters' daze firmly fixed inside them. Ashwiny Iyer Tiwari is a Lady Preston Sturges, and this film's breathless comic atmosphere, where everyone has something to say, coupled with its combustible energy, suggest the best of Sturges' screwball comedies. As in a Preston Sturges movie, Bareilly Ki Barfi hardly breaks away from its wisecracks to offer you moralistic asides or stop to give itself heavyweight airs. The characters are all always saying something wrong or inappropriate, and their double-takes and recoiling in disbelief are what give the film its crazy tone. The jokes, a freakish marriage of insta-Hindi-shaayaris and romantic idealism, come out of left-field and they are over before you can even register them completely. In the audience I watched the movie with, a Mexican wave of laughter often swelled up, with people explaining to those seated beside them what the last line or jabberwocky was, or what it meant, and as they explained it, another gem sprouted up in the interim, and was missed. Bareilly Ki Barfi's streetwise attitude fits perfectly with its protagonist Bitti Mishra, who's too much in love with the supreme juices of life to pause and dwell over life. 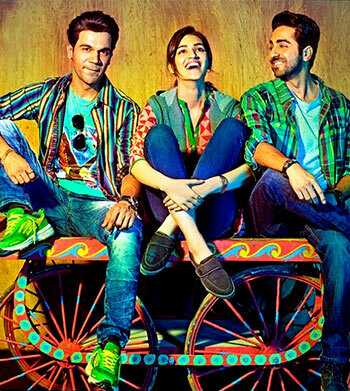 An electricity board employee who walks into offices with her scooter helmet on, Kriti Sanon's character isn't pitched at the height of a rebel, but a hedonist -- she loves her addictions and they have become a part of her everyday routine. Thankfully, the movie isn't out to worship her but to celebrate her spirit, and Sanon, with her face forever eyeing a discovery and rejoicing when she gets to one, gives a knockout performance. It's a marvel that she looks like the Bitti Mishra-types, complete with her frizzy hair, dry lips, and partly worn-out sweaters. Sanon and Ashwiny Iyer Tiwari work out the rambunctiousness of the character so perfectly that you miss her when she isn't around. Her spirit pervades the whole movie. Bitti has that tomboyish burp-after-beer swagger, but those patterns only gadroon her lady-like aspects -- like how she pokes her finger on someone's arm when she lapses into pleading. The finest compliment one can pay to Sanon's performance and her character is that she makes herself worthy of all the madness she sets off and chances are high that you'll walk out of the theatre in love with her. In a world where people shout out their names complete with their last names, Bitti Mishra crosses path with Chirag Dubey (Ayushmann Khurrana), who has written a novel, the central character of which has the same deviltry as Bitti. Dubey claims that the book -- which gives this film its title -- is a book written by tears; it's a second-rate roman-e-clef that he'd conceived after a serious heartbreak, and the Barfi of the book was meant to be a stand-in for his ex-girlfriend. The book sells no copies, but when Bitti purchases it at a railway station and reads through it, she is astonished at how well she has been described and decoded. She doesn't say it, but the book saves her life and botches her attempt to escape from home -- which also happens to be the home of such incredible actors as Pankaj Tripathi and Seema Bhargava who play Bitti's parents and who threaten to spin this movie off into their personal little world of she snoring in her sleep and he (Tripathi) spelling out all his dreams to a slow-moving ceiling fan. Bhargava and Tripathi are so good here that they stake claim for a movie of their own. Tripathi's face and manner becomes the perfect advertisement for his sweet shop and his puffed mouth, perpetually trying to keep his paan from spilling out, gives his face the quality of a memorable gargoyle that he carries around with him. Seema Bhargava, as the moral science teacher who settles down into sharbat and tea making when at home, has rapturous scenes with both Tripathi (one look at the couple and you get the colourless history they share) and with Sanon. The mother-daughter rat-a-tats with all their manic-depressiveness are genuinely felt and never overdone, and for this dynamic especially, Ashwiny Iyer Tiwari seems to be using up material from her own life (there's something weirdly personal about those bits). At any rate, the book that changes Bitti Mishra's life is only ghosted by Dubey, with its authorship being assigned to a sad-sack named Pritam Vidrohi (Rajkummar Rao). In the reality of the narrative, Bitti wants to meet Vidrohi, but Dubey can't reveal that he is the true author of the book. And so he whips up a sadistic haiku. The nifty premise of Dubey turning the catatonic Vidrohi into a thug -- he coaches him into it -- so that Vidrohi can break Bitti's heart is perhaps the plot point that Bareilly ki Barfi scoops out of Nicolas Barreau's The Ingredients of Love, but this movie is its own beast -- drunk up on an entirely original magic potion. Both Khurrana and Rao are terrific physical performers, and they tune into each other's timing like two improv-comedians helping each other polish their act. Ayushmann Khurrana often gets far less credit than what he deserves, and that's maybe because his performances are always carved out as ideal foils for those around him. One of our most generous actors, Khurrana, here again, sets up the stage for his co-actors to play off him and flower. His understanding of small-town mindsets goes beyond just the intonations -- it's also visible in the way he finishes off his kulfi and blurts out 'Khaathey Main Jod Lo' before the last slurp can go down. Even as he turns puppy faced for Sanon's Bitti, Khurrana doesn't make his character an innocent puppy. With his best friend in tow, he plays cruel little games on Rao's Pritam Vidrohi. While they are constantly putting Vidrohi's life on the line to further their own plans, they also derive pleasure out of using him almost as their personal Gimp. Rajkummar Rao's uninhibited comic performance as Pritam Vidrohi feels like an act of the Method Actor tapping into his favourite playlist. Sliding in and out of his Mama's Boyish-ness, Rao shoots the film sky high every time he appears onscreen. This is the Method Actor making you aware of his process while playing a character whose dignity depends on how well he method acts. The entire stretch of the movie where the slouch-shouldered Vidrohi transforms himself into an exaggerated rogue and then impresses his new personality upon Bitti Sharma's family must rank among the greatest screwball achievements of Hindi cinema. The big magic in those bits is in the way each actor works to keep the other actors vivid for us. Casting wise, the film is one of the most finely thought-up ensembles of the year. As one expects of a thin story such as this one, there's some dawdling toward the end, but even then, there's always a moment of inspiration, or a crazy comedy, or a frayed nerve giving the proceedings enough motor. But even through these minor problems what supplies the movie its crazy, maniac energy is its fast-talking. I don't remember another Indian film -- at least in recent times -- where the actors seemed so much to enjoy saying their lines that they are literally floating by the end of their sentences. The utterances in Bareilly Ki Barfi are what give the movie its ballad-like quality. This could well have been marketed as a musical created purely out of fast-talking: of the word 'Healthy' being used as a quick substitute for the word 'Fat' of the alliterative effect in the names Bitti and Bubbly; of Khurrana taking leave of Bitti's parents with three random words: Barfi. Moongfali. Dhanyawad. There's no way to rationalise the pleasures of Bareilly Ki Barfi -- as a character study it may not quite come together and some of the arcs arent investigated in toto. When Khurrana's Chirag Dubey draws the link between love and sacrifice (Pyar kiya hai, kurbani toh deni padegi), or in a scene between Pritam Vidrohi and his mother, when we get a hint of how the mother may have been strangulating the son with her love and turned him into the bungler that he is, the film warns us that it wants to wend off into darker territories: but it soon regains its comic consciousness. If Bareilly Ki Barfi has problems, they would mostly occur to you as afterthoughts. For the movie is a lot more than its various scrubby elements: It's primarily an invitation to give yourself over to its flakiness. When I was watching Lipstick Under My Burkha, I felt as though the crowd had come prepared to be somber and ready to value the supposed 'revolutionary ideas' of the movie. They had come pre-decided about their feelings for the film -- that if they weren't appreciative enough of Lipstick Under My Burkha, they would, in a way, be exposing their own smallness. That was revolution by the numbers. The audiences who'd come for Bareilly Ki Barfi didn't seem like they were expecting the movie to be anything more than a silly rom-com. But Bareilly Ki Barfi ended up surprising them, and by the end, they were all having such a good time and seemed so happy to be in that theatre together, that you could see why cinema was always meant to be this communal experience to be taken in without pre-judgments. There were moments in the movie when a loud laugh escaped my throat. But it didn't seem to matter. Because they were all laughing and my laughter was getting drowned in the laughter of those around me.